Finally, after Run-DMC was nominated 2008 for a 2009 induction into the Rock and Roll Hall of Fame and it was confirmed on January 14, 2009, that Run-DMC would be one of the five inductees to the Rock Hall, today Run-DMC was joining the Rock and Roll Hall of Fame! After Grandmaster Flash & the Furious Five in 2007, Run-DMC is the second rap act to be awarded the honor. Today night, Saturday April 4th, 2009, the induction ceremony was happening in Cleveland. It was Eminem to held an induction speech for Run-DMC. 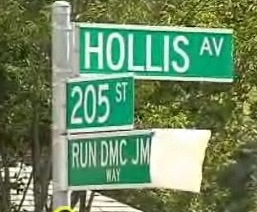 Run and DMC attended the ceremony surrounded by their families and that of JMJ. Read more at www.mtv.com (re ceremony) and USA Today (re nomination). And don’t miss HipHopRX‘s article! Bill Adler – the author of the Run-DMC biography “Tougher Than Leather: The Rise of Run DMC” – has teamed up with Cey Adams – a well known designer who has worked for countless hip hop artists – to release a new book entitled “Definition: The Art and Design of Hip-Hop“. The book, which hit stores just a week ago, highlights the careers and artwork of hip-hop elders as Run-DMC, Dapper Dan and Snoop Dogg and many others as well as contemporary artists, featuring over 200 photos. If interested, check out the interview with Cey and Bill at www.sneakerfreaker.com. The interview provides some background these guys come from and why their book could mean something to the hip hop world. There is also a book review at Mic to Mic Blog, who’s author was so friendly to notify me that this book has been released. I personally have not had my hands on the book yet, so can’t tell if it is any good. You’ll have to check yourself. VH1.com recently published two articles dealing with the topic of JMJ’s murder. While not revealing a lot, it looks a bit like there is some movement in the case currently, people revealing information/thoughts unheared before. So there are signs that somebody might have shot at the gun men as they were leaving the studio. If interested, read the two articles “Jam Master Jay’s Murder: Run-DMC DJ’s Friend Randy Allen Responds To New Allegations” and “Who Shot Jam Master Jay? Were Killers Caught On Video?” at VH1.com. The latter summarises a meeting between Randy Allan (JMJ’s friend and business partner) and Marvin Thompson (JMJ’s brother). Just came across this nice video on YouTube. It’s an excerpt from a show named “Reading Rainbow” in which Run-DMC raps over the My Adidas beat and a slightly slower played Peter Piper. Also Jay is dopping some rhymes – not to bad indeed! Enjoy it.